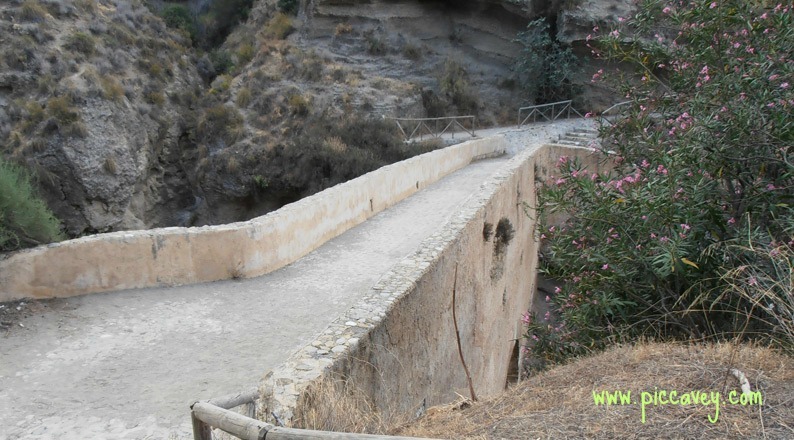 As you drive from the motorway exit and take the road to the Alpujarra, (signpost for Lanjaron) you cross the steel bridge over the Tablate gorge. This white Steel bridge was built in 1990´s. It is 200 metres long and 25 metres high. It is in a strategic location. To get from the city of Granada to the Alpujarra region it is the only road. The deep gorge below has to be crossed to reach the villages beyond. 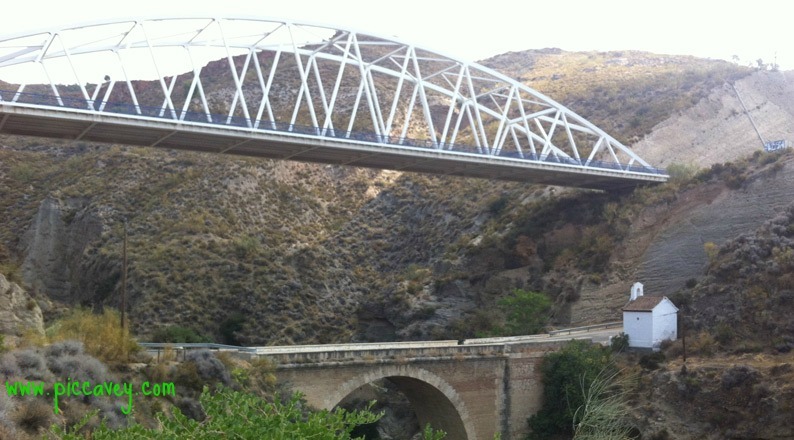 The Gateway to the Alpujarra is the Tablate Bridge. Historically this place was the key to many battles. 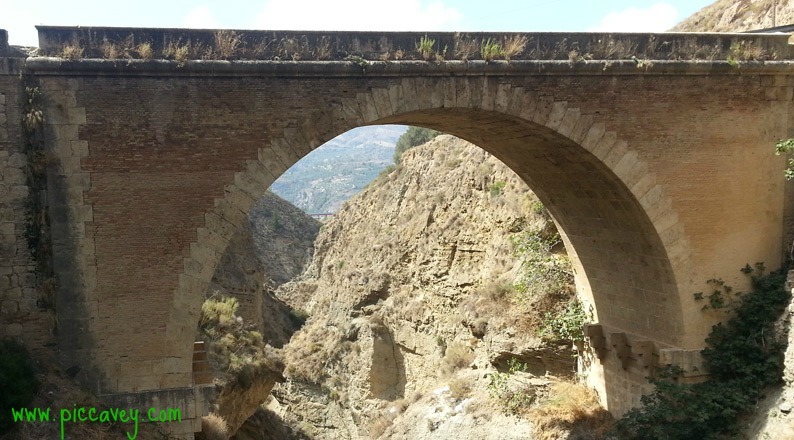 When we read about the Alpujarra wars the bridge features in many stories in different centuries. Of course there have been many bridges over the centuries as the Poet Pedro Antonio de Alarcón wrote after his 1872 visit. “Quemados unos, volados otros, y todos cubiertos de sangre de fenicios, cartagineses, romanos, godos, árabes, moriscos, austríacos o franceses, y, por supuesto, de españoles de todos los siglos”. There are four bridges visible over this gorge now. The most modern one is new steel one. 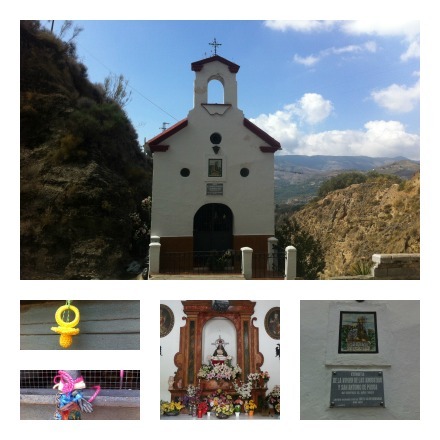 This connects the motorway with the road to Lanjaron and the Alpujarra villages. Then there is the ´new bridge´ next to the Hermitage. You can also drive or walk along this one and the oldest bridge one, from beginning of the 16th century. You can walk across it but it is no longer part of the road. Further down a fourth bridge is visible. This red metallic bridge is part of the motorway going down to the coast. Today we can see the twin bridges parallel to each other. The old bridge or Puente de Tablate is not very long and clearly made from the rough materials of the time. On the new bridge to one side is the Hermitage Virgen de las Angustias. This tiny chapel was built in the in 19th century. This would have been used by travellers passing through. Still today there are flowers left there today. And beyond the Hermitage is the Inn or Venta which once would have been busy with travellers and carriages. Is now unused and actually is up for sale (Oct 2014). The most important time in the history of the bridge was in 1569. After the Catholic kings has conquered the city of Granada the Morisco rebelled. The Muslims which fled from Granada moved south. According to the chronicles of Diego Hurtado de Mendoza. Just past the Hermitage along a narrow corridor between the rock on 10th January 1569 a key battle in the Alpujarra Wars was fought. Christian troops commanded by the Marques of Mondujar attacked the 3500 moors that were defending their leader Aben Humeya. The Christian troops were 2000 men with 400 horses. The moors had destroyed the bridge and were hiding in this narrow passage. Protected from the Christians troops couldn’t reach them over the deep gorge. 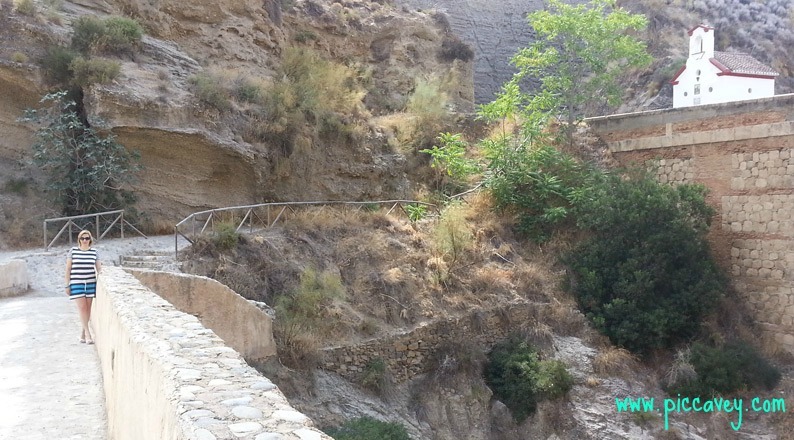 However a Franciscan Monk named Cristóbal Molina who was with the troops took a few steps towards the broken bridge. With a cross in one hand, a sword in the other hand crept over the remaining wood and leapt across the gorge, lading safely on the other side. A soldier followed him but fell to his death down the deep gorge. Another soldier tried and luckily got to the other side. With the friar and the soldier they took rocks and wood and rebuilt the bridge protected by the musketeers firing at the opposition troops. Once the bridge was ready the horses and artillery crossed safety and set up in the village of Tablate. The village of Tablate which was located close to this bridge is no longer. However there are still a few reminders of the history of this place. It was inhabited until 1960´s. The last occupant a shepherd was there until 1990. Many of the families were Galician descendants which repopulated these regions in the late 1800´s Families such as los Abarca, Aporta, Fernández or Gómez. Currently in the village you can a brick made bakers oven and the remains of cobbled streets. The ruined church was the Iglesia de Santiago from 16th century, this was rebuilt around 1605. The defense tower (and defense walls) dating to 16th century would have been the lookout to defend the bridge from Felipe II in the Alpujarra Wars.